Like most major cities in the world, it’s good for the soul to have the opportunity to escape Ho Chi Minh City from time to time. Contrary to popular belief, there are plenty of rejuvenating destinations that make for an ideal day trip from Vietnam’s sprawling metropolis. Some are just a bus ride away on the city’s main expressway, providing ample opportunity for even the most last minute escapist to leave for a nearby, day trip from Ho Chi Minh City. This picturesque beach town rests 113 kilometers southeast of Ho Chi Minh City, and traveling there takes about 2-3 hours depending on your mode of transportation. It’s best to travel here during the week to avoid sizeable crowds. Generally speaking, Ho tram does a better job than Vung Tau in upkeep, and is perhaps one of the cleanest beaches to visit when making a day trip from Ho Chi Minh City. 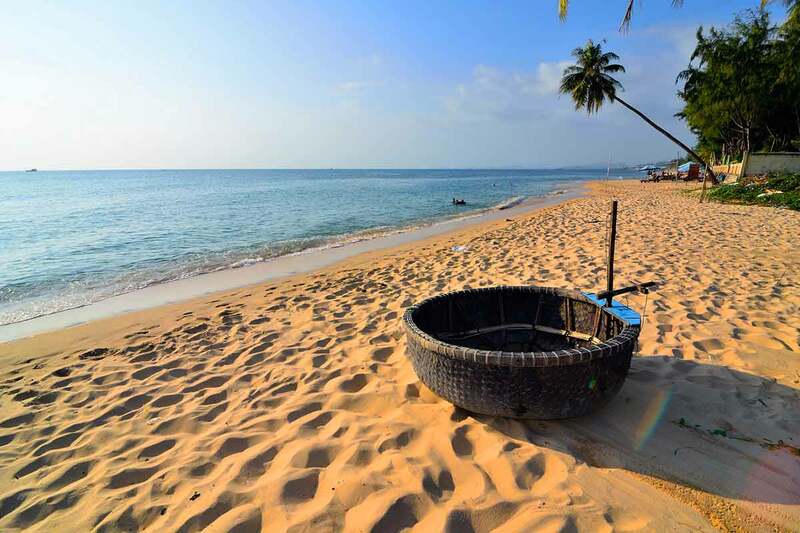 The primary beach spans about 10 kilometers and has seen a fair amount of development as of late. The Grand Ho Tram is perhaps the most notable resort in the area, and there are serious plans to initiate significant expansion in the very near future. 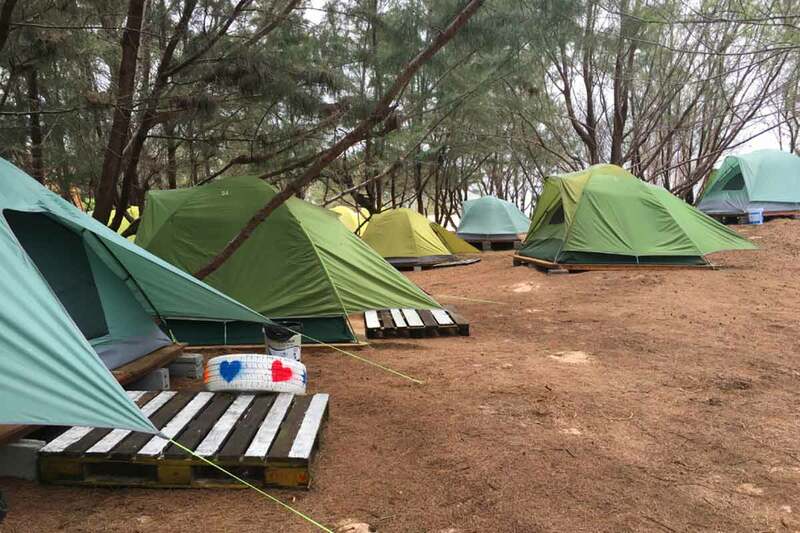 If you like the outdoors then Ho Tram is a great place to go camping and reconnect with mother nature. Book a tent for the night or bring your own. There are more places like this popping up, and it’s not hard to find yourself a private little slice of beach all to yourself. River Ray Estates: If you have your own tent you can camp here for VND 90,000. Keep in mind there are no tents available for rent, so you need to bring one with you. Saigon Container: You can choose to camp in the woods or just a few meters away from the beach. Throw down a few bucks and this thatched beachside hut is yours. I stayed here myself and absolutely loved it. Slightly north from Ho Tram beach one can find Ho Coc, a mildly unpopulated u-shaped beach lined with golden sand overlooking unsullied forest. Scattered about the shoreline you can discover a fair amount of seaside shacks and makeshift seafood restaurants dishing up impressively fresh local fares. Ven Ven Hotel: This is a wonderful restaurant along the coast. If having a proper meal in a gorgeous natural setting is up your alley then give it a go. Ho Tram BBQ Restaurant: It’s just five minutes from The Grand Ho Tram and is easily accessible by taxi. Expect well presented, mouthwatering BBQ, seafood, fried rice and much more. Each table features its own grilling station and Vietnamese and Chinese style barbeque are in order. This establishment provides an ideal opportunity to enjoy both local and international cuisine on your day trip from Ho Chi Minh City. Hop on your motorbike and drive until you reach the river bank. From there, enjoy the experience of the river ferry (VND 4,000 per bike) which will tow your motorbike across the waterway.This is a really unique experience as travelers remain sitting on the motorbike as it’s lugged across the intimidating murky water. Just one hour or two hours after your departure from Ho Chi Minh City, you will find yourself in another world, far from the bustling likes of the city. After the ferry has reached the port, the landscape pops with lush greenery, rice paddies and winding dirt roads amidst bamboo village huts making for an idyllic natural scene. Scorpion Island or Bo Cap Vang lies 63 kilometers southeast of the city. 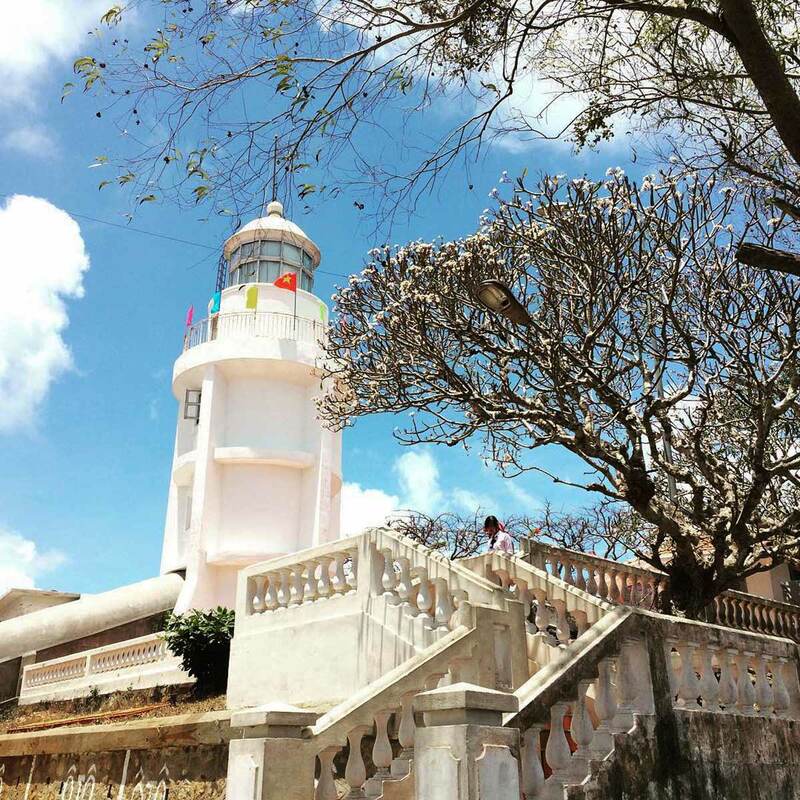 Entrance fee to the island is VND 100,000. Note that it’s best to start your day trip from Ho Chi Minh City early as the park closes at 5 PM sharp. The zipline is perhaps the best activity to engage in if you’re not afraid of heights. Climb the wooden platform, grab ahold and let her rip. Although the height of the platform is not marked, I would estimate it’s about 3-4 meters tall, so it’s nothing too intense, although caution should be taken into consideration. From time to time, you can find an inflated blob at the end of the zipline. I’ve visited twice and it was not there the during my second visit, so I’m not 100% sure if it is always in use. 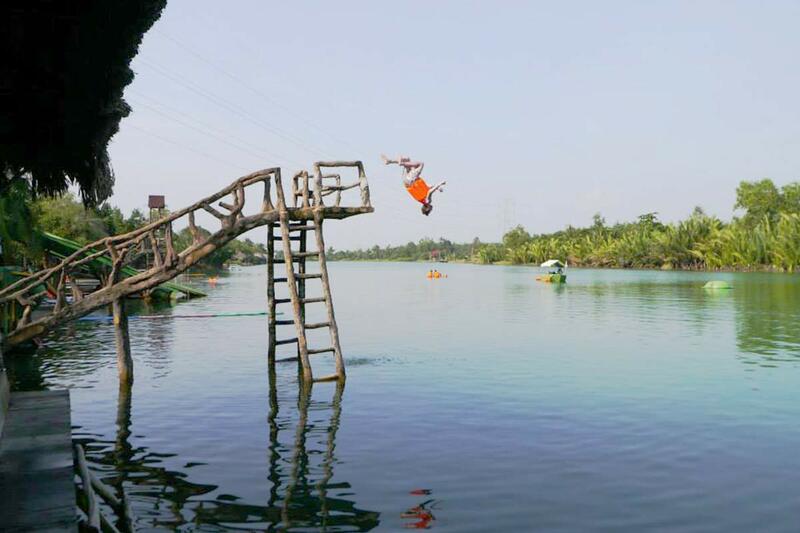 Once you release from the zipline onto the blob, you will be thrown into the air making way for an entertaining plummet into the lukewarm waters of the river. It’s loads of fun. Canoes are available for rent on the premises for VND 50,000. Go alone or paddle away with a friend to explore the picturesque scenery along the banks of the river. Enjoy your time reconnecting with nature, but be sure to watch out for nearby swimmers. Fishing is a great way to spend an afternoon on a day trip from Ho Chi Minh City. On Scorpion Island, you can rent a rod and try to reel in that big one. If you’re lucky enough to catch something nice, feel free to cook it up on site. Small, portable BBQs can be rented for a few bucks. Scorpion Island is not a village. It’s a small plot of land utilized for outdoor recreational activities. Therefore, it is suggested you pack your own picnic. If you don’t feel like lugging around heavy coolers, you can order food from the small restaurant on site. However, the food is not that impressive, and in my opinion, a bit overpriced for the quality. Can Gio is also referred to as Monkey Island and rests about 75 kilometers southeast of central Vietnam, making it a one of the most convenient day trips from Ho Chi Minh City. It is most accessible by a speedboat which can take around one hour. Traveling by car or motorbike could take 2-3 hours. However, be warned that the area is laden with monkeys scurrying about so if you aren’t into the whole primate thing, this might not be your cup of tea. Can Gio is a listed UNESCO Biosphere Reserve due to its impressive plethora of biodiversity, containing over 200 species of wildlife and 150 varieties of indigenous vegetation, laid out over 757.4 square meters. 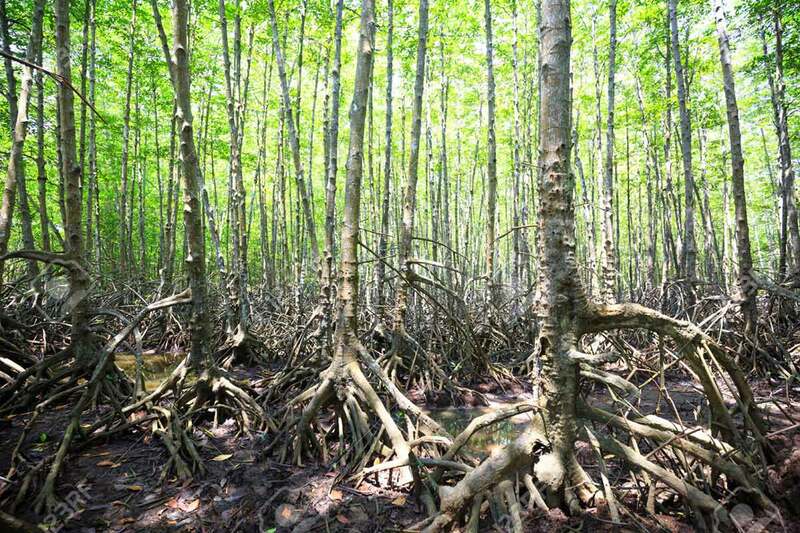 It’s well known for its extensive mangrove forests, and serenely rests where the Saigon river meets the sea. Can Gio boasts some of the best natural scenery found in close proximity to Ho Chi Minh City, so if you get all fired up about nature, pack your bags and hop on the next speedboat. The wetland abounds with monkeys, crocodiles and an assortment of exotic, colorful birds. There is much to see. Welcome to the gateway of the Mekong Delta. 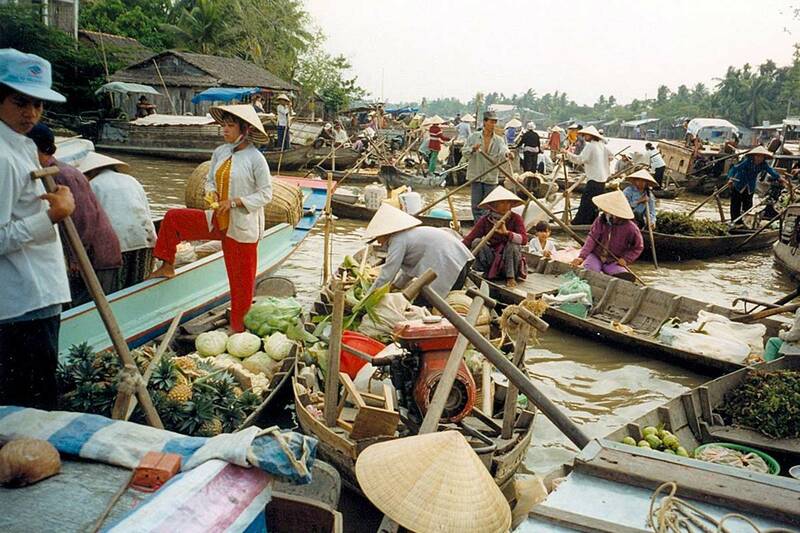 Can Giuoc Market is a lively scene on the banks of the Saigon river. Here, you can catch a glimpse of the rich Mekong culture as the local community goes about buying and selling their goods. Get your cameras ready because there are loads of captivating images to capture. This is a place to get your row boat on. Kick back and enjoy a ride through the tropical forest before you begin your trek through this prolific mangrove jungle. If you’re brave, you can feed fish to the crocodiles on the reserve or try your hand at crab fishing. We also highly recommend heading off to Bat Swamp where you can witness the remarkable flying foxes in their natural habitat. Getting to Vam Sat Eco Park takes about three hours by car or motorbike. 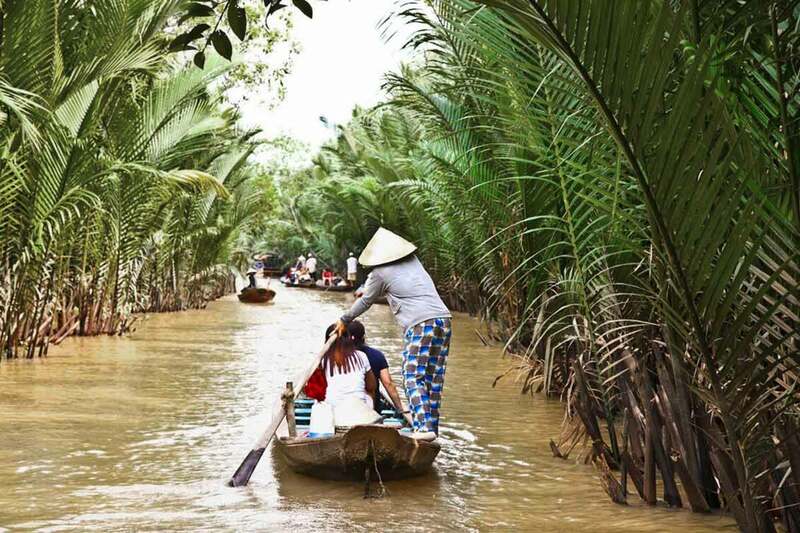 If you opt for a full tour package as seen below, you’re looking at a 7-8 hour day trip from Ho Chi Minh City. It’s probably best to just eat lunch with your tour as the restaurant scene in the region is most certainly lacking. Currently, there is not much information about proper restaurants on Monkey Island. We suggest finding a packed restaurant and ordering whatever the locals are eating. They know best, and a full restaurant is always an indicator of good grub. 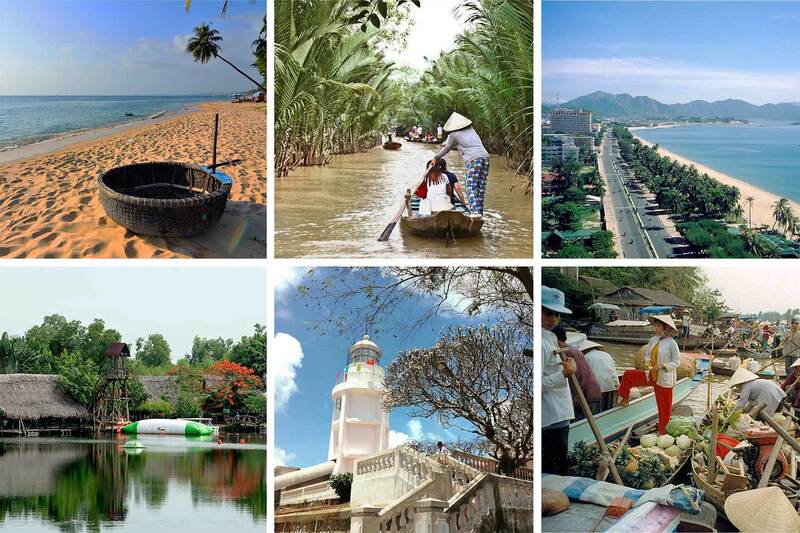 Can Tho is the centriole of the Mekong Delta and one of the biggest cities therein. Can Tho is 171 kilometers from Ho Chi Minh City and traveling there will take about three hours. For many years, it has served as the principal economic and cultural hub for much of the Mekong region, and has grown to become a reasonably large town awash with numerous restaurants, hotels, tourist sites and bars. In fact, the nightlife along the banks has become quite famous. As the sun fades over the riverside it transforms into a visual treat as the illuminating neon lights reflect an uncanny and charming Mekong Delta vantage. It’s 32 kilometers from the Can Tho pier and renting a boat for a tour will cost you roughly USD $25. Here you can witness timeless boat to boat trade of snacks, exotic fruits, food and much more. The best part about this market is it’s not fully adapted to tourism yet and still retains much of its authentic formula. At this market you will encounter the locals going about their business, chatting from boat to boat, selling, buying, laughing and doing what they do best. Cai Rang is quite similar to Phong Dien market but makes for a shorter journey as it’s a mere 16 kilometers from the dock. As you traverse the canals leading into the market area, visitors can take in the pleasurable scenery and get a glimpse of local life along and atop the waterways. Although it’s still referred to as the old market, it has recently been relocated further north to the central market, making way for a more tourist-friendly shopping scene. Customers can peruse a selection of more upmarket good such as clothes, souvenirs and artisanal lacquerware. If you want some gifts to take home, this could be your spot. If you want authentic, handmade goods it might be advisable to skip this one. Street food. Street food. Street food. If you’re a foodie visiting Can Tho, be sure to add the Tay Do Night Market to your itinerary. Name it and they have it. From fried tofu to skewers, seafood and the best of Can Tho’s local fare, everything is to be had. And the buck doesn’t stop there as the market is home to a range of other goods, and renowned for its rich culture as well as being one of the most famous markets in all of Vietnam. It’s not to be missed on your day trip from Ho Chi Minh City. This temple is well impressive as it rests unperturbed, majestically overlooking the placid Can Tho river. It was built in the 19th century as a sacred ground of which to worship Kuang Kung, a Chinese deity referred to as the ‘god of business’. It’s perhaps one of the most notable religious sites in the region. This rice cake is native to the region and is steamed using the magenta plant in order to give the snack its attractive purple hue. Other ingredients include coconut milk, meat and salted duck eggs, before being wrapped up in the magenta plant leaf. It’s chewy. It’s salty and slightly sweet. Try it. If you’re a meat eater this one should most certainly be on your list. Unlike many meat-based dishes in Vietnam, the fat is removed from the pork making for a lean and tender bite. After the cuts have been selected, the pork is mashed and rolled into a ball before being slid onto bamboo skewers which are grilled over charcoal. You can eat it right off the stick or use the meat for a Vietnamese style roll. Take some sauteed vermicelli, scallions and chives and roll it up in a crispy piece of lettuce. I call it a Viet-ritto. Most often eaten for breakfast, this southern staple consists of rice and thick tapioca noodles mixed with an assortment of herbs and pork which is then doused with a rich coconut dressing. The dish is then steamed inside a charcoal oven and served with fish sauce, bean sprouts, pickled veggies and cilantro. It’s cheap, it’s simple and makes for a marvelous breakfast on your day trip from Ho Chi Minh City. 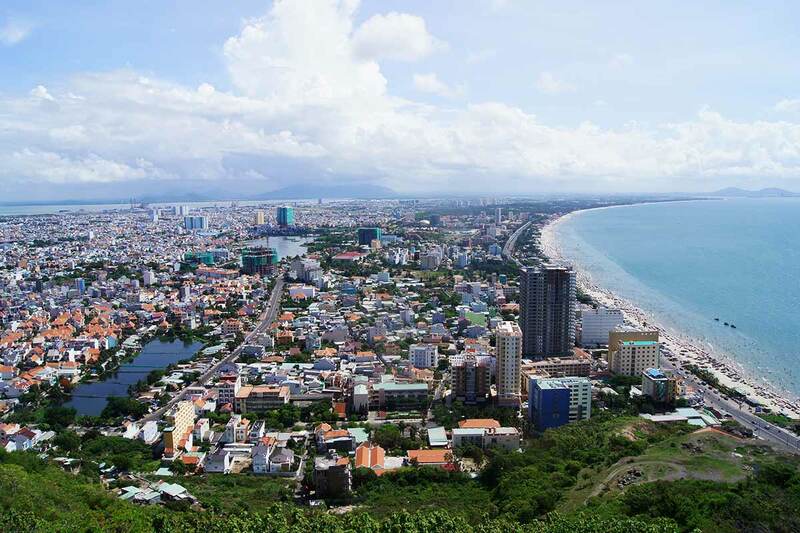 We believe in giving it to you straight up, and we must admit that although Vung Tau makes for a nice getaway from the madness of the city, it’s not the cleanest beach by any means. That being said, it’s still a quiet coastal town and offers visitors the chance to just escape the city and take it easy. It’s 95 kilometers from Ho Chi Minh City and you can get there around two hours or so via bus or car. If you don’t like crowded beaches it’s best to visit this area during the week. Once the weekend rolls around the daytrippers pack in like sardines. You can rent a chair and an umbrella for VND 50k per day. The best part about this section of the beach is the convenience. There are loads of refreshment stands and food carts scattered about providing easy access to cheap food and cold beer. Front beach is not much different from back beach other than it’s less crowded. It’s a decent place to take a stroll and dig your feet into the 10 kilometer stretch of sand. 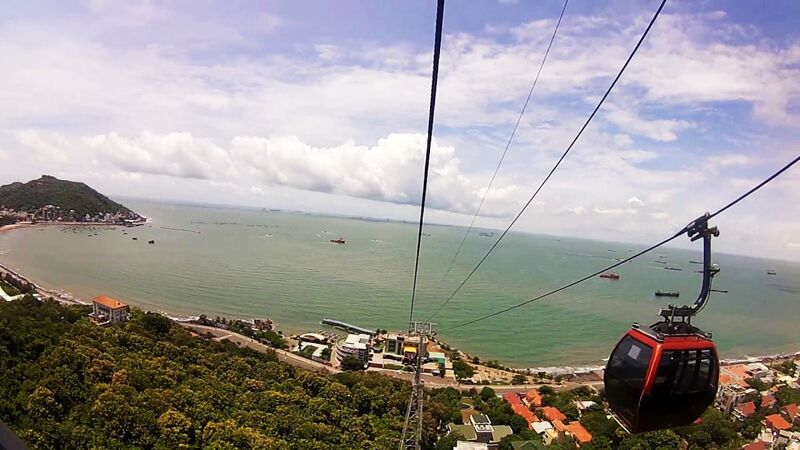 This park requires a scenic cable car ride to the top of the mountain on which it resides. 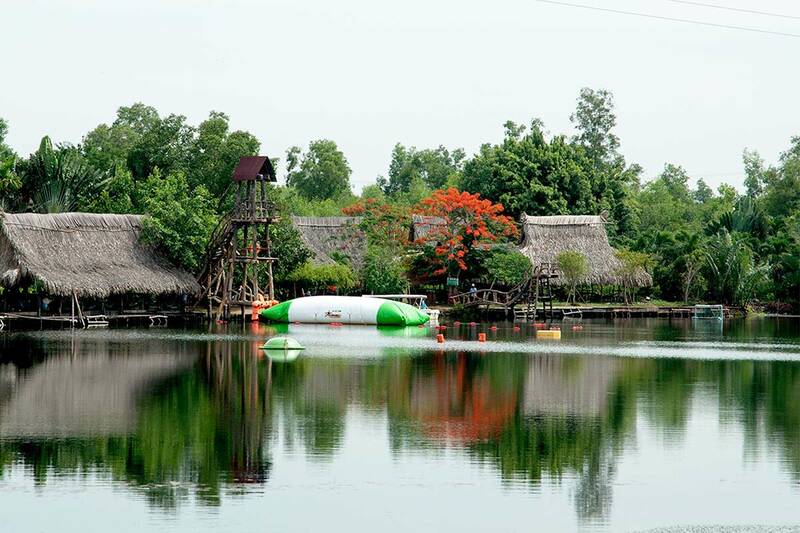 There are an array of activities to enjoy in the park including a zipline, a sand playground, bumper cars, a 5D cinema and a sweet water park. There is much to do for both youngsters and adults, and makes for a great way to spend your day. 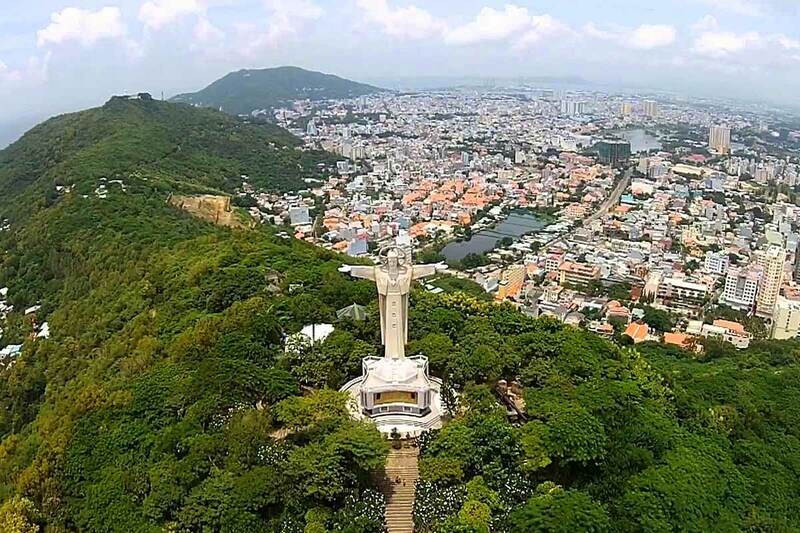 It towers over Vung Tau City as it’s perched on top of a mountain. The statue stands at 36 meters tall, and closely resembles Brazil’s ‘Christ the Redeemer’. Taking the 810 step trek to the top taking gives you a bird’s eye view of the city and majesty of the South China Sea beneath. There is no entrance fee, but a strict dress code is enforced requiring guests to remove their shoes. Knees and shoulders must also be covered. Erected nearly one hundred years ago in 1907 by the French, a visit here provides a sweeping 360 degree viewpoint. During your ascent to the top, you can enjoy a few local snacks like Vietnamese yogurt (sua chua) and an assortment of cheap pastries. 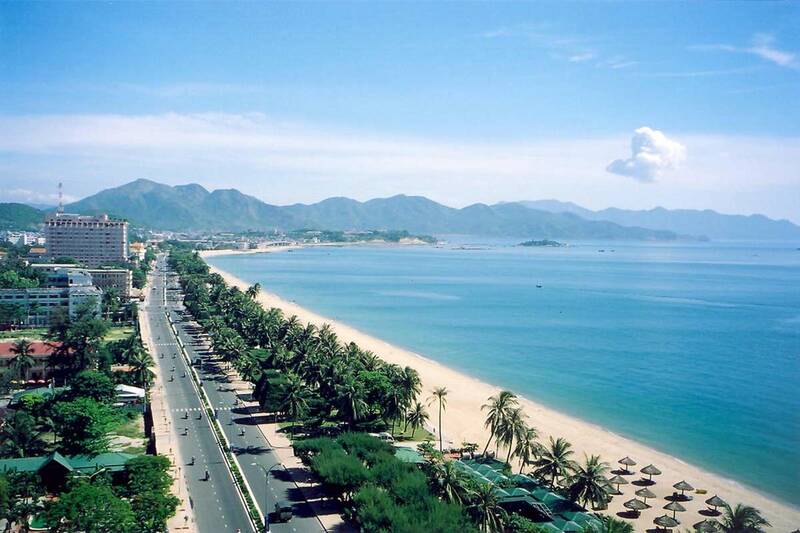 Vung Tau is not renowned for its restaurant scene, as most people prefer to partake in family style beachside picnics. There are loads of food stands directly on the sand. You can order what you want and they will bring it right to you. And while you’re there, dig into the Vung Tau food scene and try some of our recommended fare as seen below. It’s half the fun. The fish is first marinated in vinegar, garlic, chili and lemon, and then mixed with a peanut powder. The salad is then served with fresh veggies and rolled up in rice paper. After rolled, it’s best to dip your roll into a special sauce made with garlic, minced chili, vinegar, sugar, fish sauce, lemon, crushed peanuts and shrimp sauce. This hot pot is eaten with sawfish, banana, spinach, a spicy fish sauce and vermicelli. The broth of the soup can be done many different ways according to taste, but essentially it’s made with herbs bamboo shoots, river leaf and tamarind. The Vung Tau or Long Hai pancake has a unique recipe compared to other versions. Ingredients include rice flour, shrimp, bean sprouts and pork. What makes it unique is the special crust made with chicken eggs and filled with onions and mushrooms. It’s pretty simple and straightforward. Rice porridge with oysters. Go get yourself some. It makes for a fantastic breakfast. 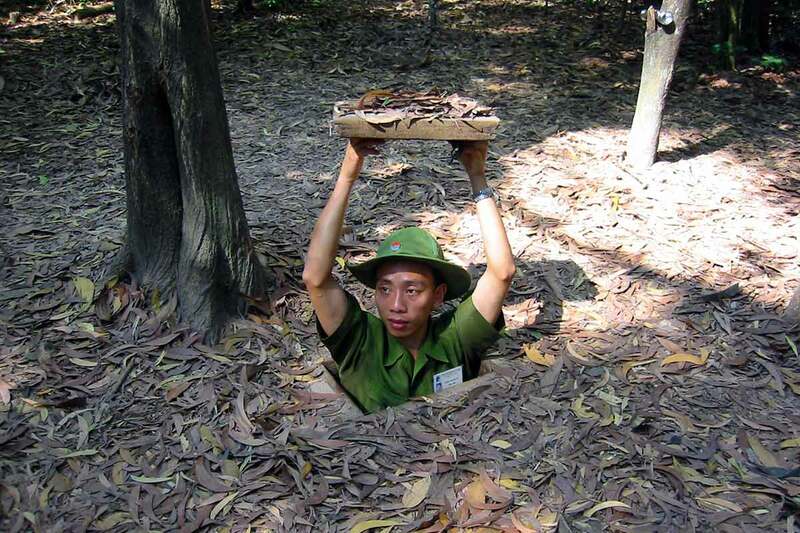 The Cu Chi tunnels are one of the easiest day trips from Ho Chi Minh City in regards to travel time. Just an hour and half out, the historical site is located a mere 43 kilometers north of the inner city limits. The location maintains much historical significance and is an immense network of tunnels utilized by the Viet Cong military during the TET Offensive and Vietnam War. 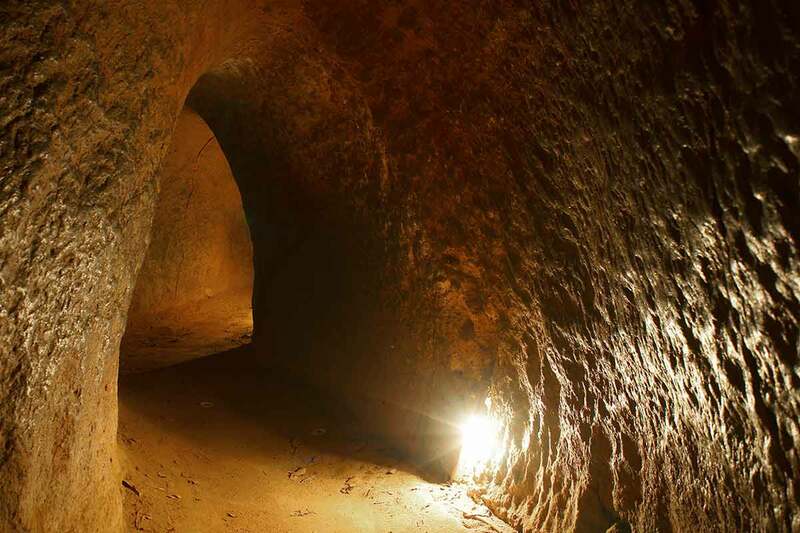 Although there are endless tunnels across the country that were employed for defensive tactics, this particular matrix connected Ho Chi Minh City to the Cu Chi district, and were a key strategic component against opposing forces. This particular channel of tunnels cuts its way underground all the way to the Cambodian border and covers roughly 250 kilometers. You can opt for a half day or full day trip setting off from Ho Chi MInh City. A tour to the tunnels provides visitors the opportunity to explore the extremely narrow underground burrows, and some packages will take you to a nearby Cao Dai temple as well; a bizarre but fascinating religious sect which worships the ‘Divine Eye’ and combines the beliefs of many different theological ideals. If you’re into history and learning more about the Vietnam War, this is a place you must surely visit.